ARC grad finds healing, dedicates himself to helping others find it too through the Phoenix Citadel Corps. It’s been seven years since Scotty Mechlin became sober, but not a day goes by that he doesn’t remember how he once lived. It’s this love that led Mechlin to seek help—which he says changed his life. He now serves as the Bridges to Recovery Case Manager through the Harvest Initiative at the Phoenix Citadel Corps, helping with everything from transportation and conversation, to fellowship and support for men completing the recovery program at the Phoenix Adult Rehabilitation Center (ARC). The Harvest Initiative is intended to help integrate ARC program beneficiaries and alumni into the daily life of the local corps. A graduate of the ARC program, Mechlin understands with great empathy the day-to-day struggles that many of those in recovery go through. He also knows how hard it can be to find the strength to reach out for help in the first place. Indeed, Mechlin has experienced the depths of pain and sorrow, beginning as a teenager. Following his mother’s suicide when he was just 13 years old, he said he became addicted to alcohol and began abusing substances to cope. After graduating from the ARC in 2011, he started volunteering around the corps. A licensed truck driver by trade, Mechlin could have returned to lucrative work outside of the Army—but he felt called to stay. And when the Phoenix Citadel Corps launched a new Christian-based recovery program from Saddleback Church in 2013 called, “Celebrate Recovery,” he was the first person they called on for help. A grant-funded position allowed him to continue doing what he was most passionate about: spreading the message that God is the answer both to sobriety and to life. 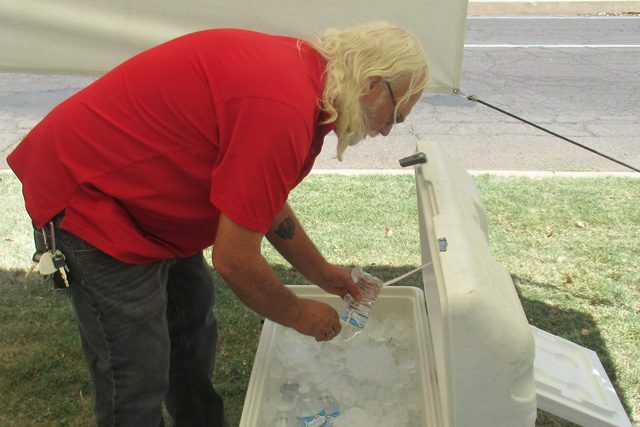 Scotty Mechlin fills a cooler with bottled water as part of the Red Shield Survival Squad, which activates heat relief stations in Arizona during extreme heat. Mechlin has been involved with Celebrate Recovery since day one of its launch. He’s done everything from teaching classes to managing the bridge house to working as maintenance supervisor. Most importantly, though, he’s the person the men call when they need support both during and after leaving the program. There needed to be a greater embracing of beneficiaries from the ARC in order to create a place for those in recovery to call home, Smith said, along with a church family. Mechlin has been the person to help build those important bridges to the corps, and Smith said he’s been “instrumental” in helping the program expand to help more people during the past five years. Once estranged from his family, Mechlin now shares his family home with his daughter, stepson and dogs, and lives “a life he didn’t think was possible,” Smith said. Ironically, he still feels like he hasn’t done enough.